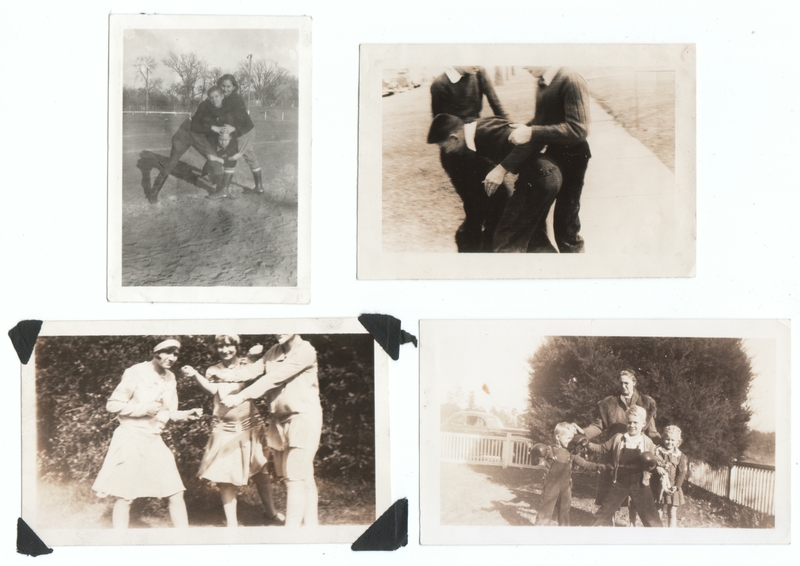 Four photos, ranging from 2.5 x 3.5 inches to 4.5 x 2.75 inches. The remains of photo album mounts are stuck to the corners of one of them. The upper right photo is stamped Beckers Camera Shop / Beckers Drug (at Walgreen’s) / Rapid City, S. Dak. Otherwise undated and unidentified. These are feel-good photos. The sort that makes you remember that even back then, people were just…people. They were funny, did things just for a laugh. Somehow, it seems like with old, formal images, the people seem stiff and very proper. These are a treat to see, because it reminds me of how people have always been pretty much the same. I especially love the upper right photo. Great contrast, and we can only imagine what happened there. Great post. Thanks for sharing! Thanks, Jenna! We’re thinking along the same lines here. I’m glad you appreciate and enjoy these, too. Hahah, yes. To me it looks like they are posing for the camera a bit, and yet it’s the sort of scenario that plays out all the time without the camera, too.